So back home we have the good old “5 a day” motto. Which means 5 portions of fruit and veg a day. How many people actually follow this rule, is another story. For me eating 5 portions of veg isn’t a problem, I love vegetables so much but when it comes to fruit, I could take it or leave it. Apples hurt my teeth, bananas make me gag and everything else goes off way too quickly. Don’t get me wrong, I love fruit as a treat once in a while but the thought of eating 5 portions everyday, makes me feel a little bit nauseous. We’re lucky in the UK that fruit and vegetables are treated as a necessity and as such aren’t subjected to luxury tax. With our terrible climate, almost everything is imported so it’s surprising that so many kinds of fruit are so cheap. Of course it’s a little annoying having to fork out a fiver for a punnet of cherries or going to the ends of the earth to find a durian priced at £10, but in general, I’d say fruit back home is priced on the cheap side. In Japan fruit is treated as a luxury item and is given a premium price to match. With such a diverse climate, almost anything can be grown here but that also means paying a high price for Japanese labor. In Japan I get the impression that fruit is seen as a treat food, something you should eat as often as you would cakes or sweets. This is reflected by supermarkets full of huge gift boxes complete with ribbons, and tissue paper displaying a couple of regular looking – albeit polished – apples. I’ve even seen melons priced at an eyewatering 10,000yen. That’s about 70 quid. Who in their right mind is going to pay that for a melon? You’d never want to eat the thing! I’d want it in an airtight container to display on my mantelpiece. isn’t “mottainai”, I don’t know what is. I’m not so sure what my point with this post is. I guess it was just to point out that whatever you are doing right now, there is someone in the world who is paying more money than sense for a melon in a gift box. I’m not that person and I can only hope that my fruit stinginess will prevent an army of fruit flies from invading my kitchen this summer. Walking up the Trainspotting inspired stairway to my apartment, I already have more than enough insect battles to contend with. 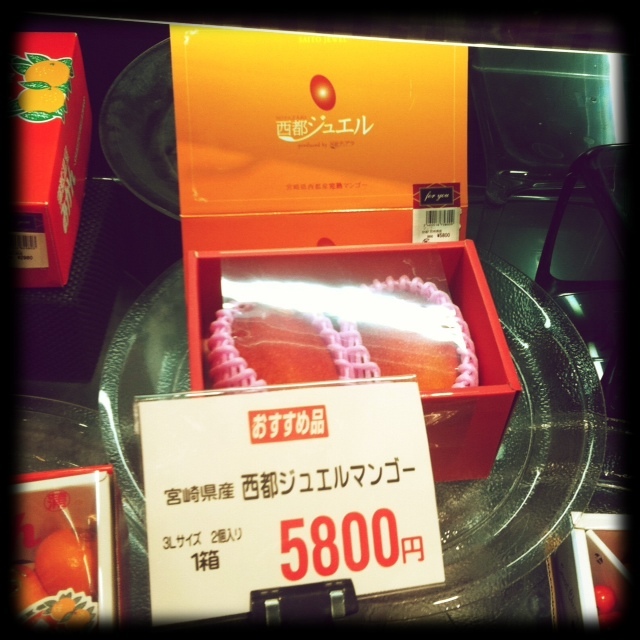 5,800 yen (£40) for a couple of mangoes anyone? They come in a box, of course. I guess life is much more formal in Japan? Or maybe rituals are just the way of life. Regarding cost, is it challenging? Anyway super interesting post.